When a larger than expected snowstorm arrived this past weekend, and as a result southwest Ohio panicked like we’d never seen snow before and canceled anything on our calendar, my family decided to make the most of it. 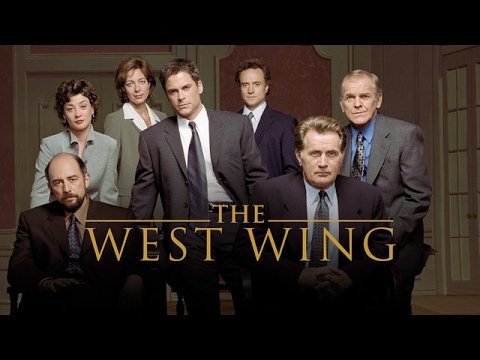 We curled up and starting from season 1 / episode 1, introduced our middle school aged sons to The West Wing. They are finally old enough to appreciate the suburb plot and character development and the incorporation of complex real world issues. We’d waited years to introduce them to our friends Leo, Toby, Josh, Sam & CJ. Good time to for me to throw in the fun fact that in addition to Dayton, Ohio being the birthplace of aviation, it is also the hometown of Martin Sheen, Rob Lowe and Allison Janey. We binge watched about twelve episodes over the course of a few days. My boys fell in love with the show just like we thought they would. Which is good because, I’ll be completely honest, this is also my attempt at subliminally brainwashing them in to careers in public service. I even got an email from my youngest last night with this GIF of Sam writing on a legal pad and tossing pages. Nothing could warm my heart more. When The West Wing first aired in 1999, I was a full-time MPA student trying to figure out which realm of public service was right for me. I was, and remain, a political news junkie. So beyond the genius of Aaron Sorkin, the subject matter of the show made it the pop culture element that I’ve always identified with most. So many of us ELGLers are around the same age that I bet you had the same major life dilemmas I did: Do I want to be Sam or Toby or CJ? Even then I knew I didn’t have any interest in being Jed or Danny, the elected official or the journalist, as much as I adore them. Fast forward 20 years, watching the series from the start with my family. I saw the role of my favorite characters and the dynamics of the character interactions in a whole new way. Having worked in local government for nearly 18 years now, I noticed many of the workplace culture components on West Wing that were completely above my head as a grad student. Though to a different degree, working in the City Manager’s office has a lot of similarities to the show. I could identify with the rapid pace of events, the quickly evolving nature of situations, and the need to balance policy and politics. More importantly, this time watching the episodes I noticed much more about the interpersonal dynamics than ever before. How members of the team might give each other a hard time, but they defend and support each other especially when the going gets tough. How sometimes there’s an easier way, but in the interest of the people impacted or involved there is a right way, even though it is harder. It occurred to me that my grad student dreams came true, though not in DC. Even my sons noticed and each made comments about how things the characters did were like my job. Indeed like Sam, I’m the lead content creator here at the city. Like CJ, I’m the lead on media relations. And like Toby, I’m responsible for our high level messaging and strategic positioning of our initiatives. Here’s the other thing I noticed watching the show. Two decades later, I’m more confident than ever that who I really want to be is Leo. The Chief of Staff. Not the role that was anywhere in my dreams 20 years ago. In many ways, truly, Leo is a City Manager. The bridge between Jed and the amazing team of characters I’ve always adored. Once again, without preconceived intention, my friends Leo, Tobe, Josh, Sam & CJ brought some clarity to my path. Only question is…What’s next? Stacy Schweikhart is an ELGL Board Member and the Community Information Manager for the City of Kettering, Ohio.